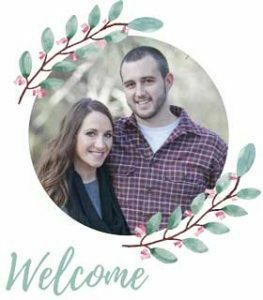 Love farmhouse style decor? If you’re looking for pieces to add in your farmhouse style home, here are some farmhouse throw pillows that you’re definitely going to love. Having unique design of throw pillows will surely give your guests an idea of what style you have. And if you love a modern farmhouse style, you’ll definitely love these farmhouse throw pillows I’ve gathered for you. Who said you only need to have a few throw pillows? You could surely add more, the different shapes, sizes and design of your throw pillows will add more character to your home. 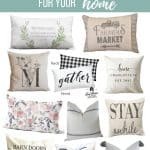 This farmhouse throw pillows post contains affiliate links, but nothing that I wouldn’t wholeheartedly recommend anyway! Read my full disclosure here. You’ve gotta have some bold colored farmhouse pillows for a touch of color to your neutral sofa! It’s simple plaid style wouldn’t be too much for your farmhouse style home. What I like about this burlap throw pillow is its made of faux burlap, so it doesn’t smell or isn’t itchy but you’ll still have the same rustic look! This shabby chic farmhouse throw pillow will add that natural vibe through the leaves print. The saying this pillow is SO cute too! Farmhouse throw pillows like this will also give your living room a fresh look. How about a luxurious looking pillow to add to your farmhouse? With the off white linen and chenille fabric, it will surely go well paired alongside floral print or any design farmhouse throw pillows. Add warmth and personal touch with this monogram throw pillow through its intricate typography. Seriously though, have you ever seen a monogram so pretty?! I love the flowers worked into the letters. With the neutral fabric and simple design, it will go with any sofa color. If ever you’re new to your home, this is the perfect pillow for you! I love it as the design will be customized to the city, state, and the year you moved! This hand woven authentic African pillow cover is so unique! I love to add in boho touches to my farmhouse style! Mudcloth pillows are a way to add lots of character to your sofa. Tassels for a bit of feminine touch? Yes, please. I love it. The simple design of stripes and grey color complements the those cute tassels well. Nothing screams farmhouse style like this Farmhouse Market throw pillow, with the farm truck design and the fabric used for the throw pillow. I think farmhouse pillows would be great for your entry way with your other rustic decor. Now here’s another rustic pillow, hand painted with acrylic paint to look distressed for a vintage look. Made of high quality fabric and effortlessly neutral allowing it to fit in with any other farmhouse pillows you already have. When you hear farmhouse, you can’t help but think of barn doors and shiplap! This cute farmhouse pillow is perfect with its neutral colors and the typography. I really love pillows with word on them! Especially with really nice typography like this one. This neutral colored pillow will match any other farmhouse pillow covers you have. This handmade floral lumbar pillow will add chic vibe to your farmhouse style home. With a splash of pastel colors, it will add more life to your space. Add this gray Home Sweet Home throw pillow in your sofa or an entryway bench to welcome your guests. If added to the guest bedroom, it will definitely add a touch of hospitality. Made of grain sack reproduction fabric with woven stripes, this pillow cover has very simple design to go with other farmhouse throw pillows. This textured pillow will work well with cotton or any smooth pillow for balance. I also like this unique designed throw pillow! With black plaid print at the back and a great typography in black which contrasts the white fabric of the pillow. It’s also like you get two pillows in one because you can just flip it over and voila! A new pillow! Farmhouse pillows add a ton of character to your farmhouse style decor. I like to think that pillows are kind of like the “secret sauce” of decorating a cozy room. Or they are like the “confetti” of decorating…and you know you can never had too much confetti on your cupcake, right? 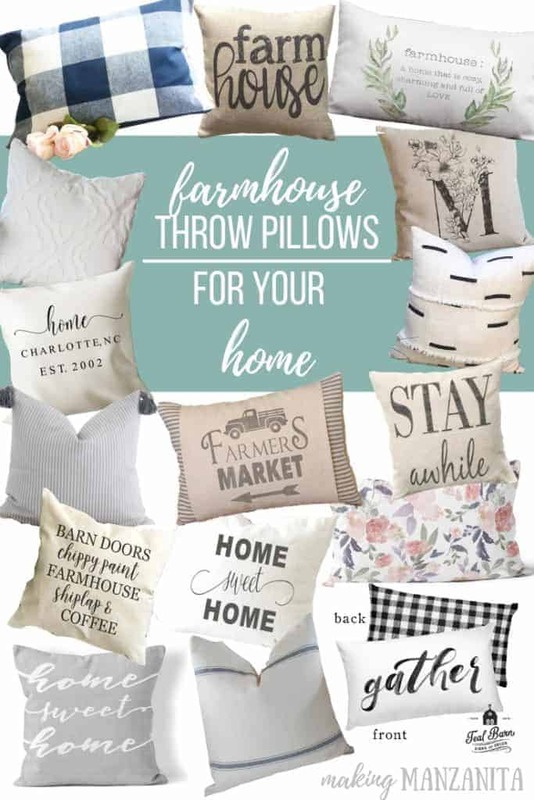 Adding any of these farmhouse throw pillows would be a step in the right direction. Which of these farmhouse pillow covers are your favorite?